You are here: Virgin Islands News Online » News » No limousines for Mapp & Potter! No limousines for Mapp & Potter! Those were the words of Senator Janette Millin Young on Monday May 9, 2016, who, as promised, moved to override US Virgin Islands' Governor Kenneth E. Mapp’s line-item veto of a section of the Emergency Vehicles bill that sought to block the executive branch from purchasing “ceremonial vehicles” for the Office of the Governor and Office of the Lieutenant Governor. 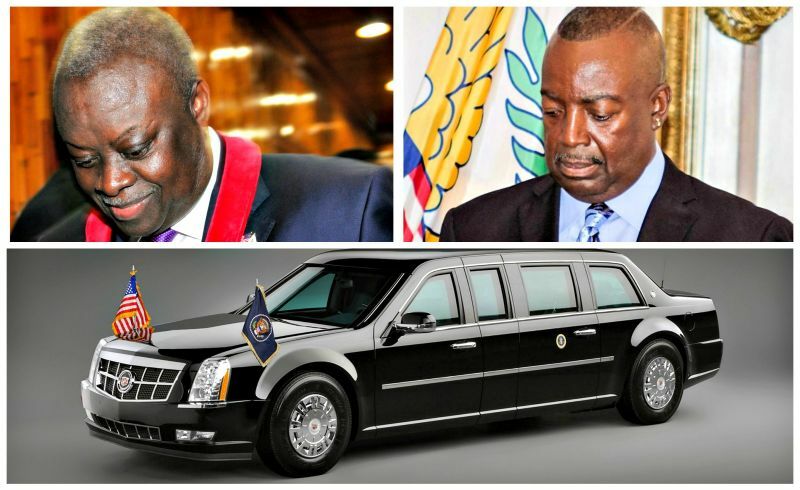 Mr. Mapp, in August of last year, had requested some $350,000 be part of the bill to purchase emergency vehicles for the territory’s first responder units, arguing that the current fleet of ceremonial vehicles was old, and repair costs were on the rise. Included in the executive branch’s budget were three new limousines costing $120,000 in total, according to Nelly Varlack, director of business and administration during testimony in August 2015. One limousine would be on St. Croix and another here for the governor, and one for the Lieutenant Governor Osbert E. Potter. Ms. Varlack did not specify on which island Potter’s limousine would be stationed. The override was the first item on the floor at an ongoing Senate session at the Earl B. Ottley Legislative Hall on May 9, 2016, where senators were working on a myriad of measures. And while most senators supported the override — including Kurt Vialet, Tregenza Roach, Marvin Blyden, Jean Forde, Novelle Francis, Justin Harrigan, Myron Jackson, Neville James, Sammuel Sanes and Mrs. Millin Young — three senators, including Kenneth Gitttens, Nereida Rivera-O’Reilly and Almando Liburd voted against blocking the governor from purchasing ceremonial vehicles. Senator Clifford Graham was recorded as absent, and Senator Positive Nelson abstained from voting. Following the veto override, Mrs. Millin — as she did when introducing the amended to block the purchase of the ceremonial vehicles — once more explained her reason for moving to override. She relegated the governor’s explanation as to why he line-item vetoed the amendment as inconsistent, and reminded senators that the governor’s financial team, during an August 2015 hearing, clearly explained what the ceremonial vehicles were needed for. She said the governor’s notion that the amendment would effectively block all departments and agencies connected to his office and that of the lieutenant governor from purchasing vehicles was unsound. “It is an overreach to say that should this section be contained in the overall Act, he won’t be able to order, for example, a firetruck or a police car,” Mrs. Millin Young said, referring to the governor. Now that we have reinstated this section, the governor, the Police Department and the Fire Department — they can all order cars. Even the governor and the lieutenant governor can order cars, which I understand are already on order from some people. However, they cannot be ceremonial-type cars,” she added. The senators would later offer an amendment to remove the word “official” from the amendment. “I don’t want any of us giving the impression that we don’t want official vehicles to be purchased because some of us do. At least I do,” Mr. James said. Still, it remains to be seen what constitute an “official” vehicle, once they are purchased by the Mapp administration. The if you read and could understand you would have seen that the issue is not purchasing new vehicles. The issue is purchasing them for ceremonial purposes. So with that being said are you suggesting that the Premier's official vehicle is ceremonial? Yes. What else is new? These guys are gone next election because they are too lavish like some of those in the BVI. No limo that's outrageous,how will they now get around? In a hoopty, what else! Next! Freaking pickup truck. They don't deserve to be riding around in no Limo. Were they asking for one like the beast? @OMG, you are right. Or maybe they can make it a motorize bike.